NBA center known for his shot-blocking and rebounding skills. 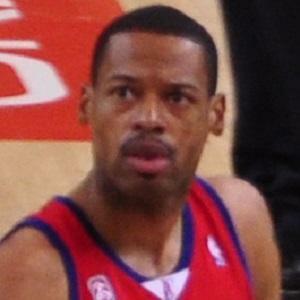 He was named Defensive Player of the Year in 2007 as a member of the Denver Nuggets. He won the Naismith College Player of the Year Award while playing for the UMass Minutemen during the 1995–96 season. He led the NBA in blocks 4 times during his career, first with the Toronto Raptors in 1998 and three more times with the Nuggets from 2006 to 2008. In April, 2001, his mother and two sisters were taken hostage by a deranged Hartford resident. The man served 18 years in prison for his crimes. He married Eva Camby and he has two daughters, Milan and Maya. He spent his last NBA season with the New York Knicks, playing behind fellow defensive-minded center Tyson Chandler.